Getting to the airport for my mini-break (sorry – “summer vacation” from Wednesday – Sunday) was perhaps the easiest and least stressful travel-related thing I’ve ever done. Last Wednesday I slept in, did a load of laundry, rocked Jillian Michaels’ 30 Day Shred, packed, and took the subway to the airport. From the time I reached Hwamyeong Subway Station (for the record, I walked there with my purse and a carry-on duffel bag) to my gate took precisely 45 minutes. I don’t think I’ve ever arrived at the airport and even gotten through security that fast! My outfit was entirely olive and black matching my duffel. Whoops. It’s a bit of a hike from the HuMetro to the Light Rail. From Sasang Light Rail station. 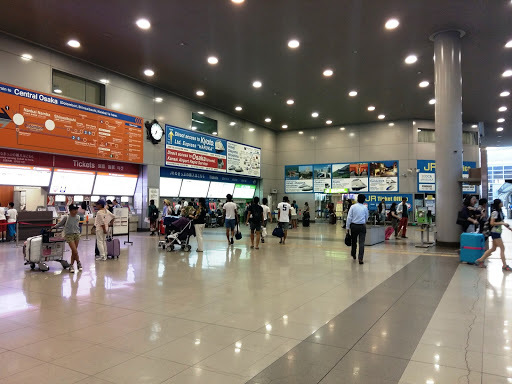 I took the green line from Hwamyeong to Sasang and then the light rail to Gimhae International Airport. You do have to exit the light rail and walk across the street to the terminals, but it was a pretty short walk and again – the whole trip took less than an hour. 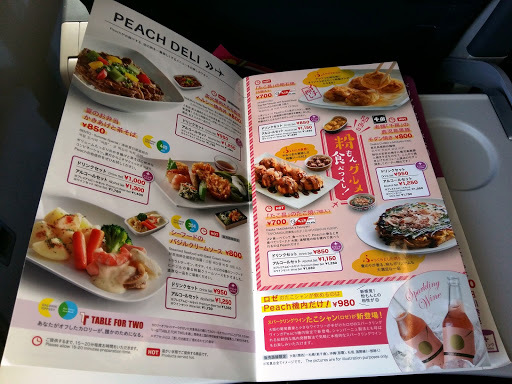 I should also mention that my round-trip airfare Busan – Osaka – Busan cost approximately $200 Canadian booking Peach Air through Skyscanner. What a deal! With free wifi all across the departure zones I had lots to read and do while waiting for my 4 PM flight. We had to take a shuttle to get to our aircraft (which was PINK!) but it was a quick ride and soon enough I was on the plane and had managed to snag the emergency exit seat with plenty of leg room. 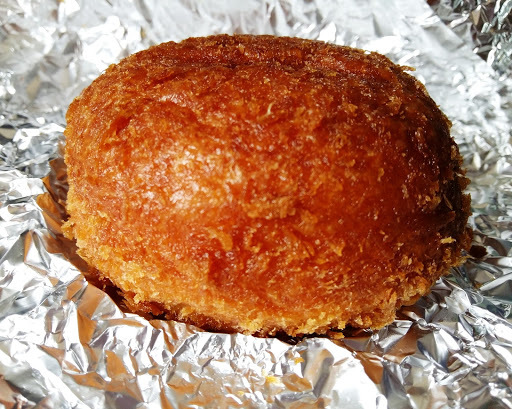 It was pretty heavenly. 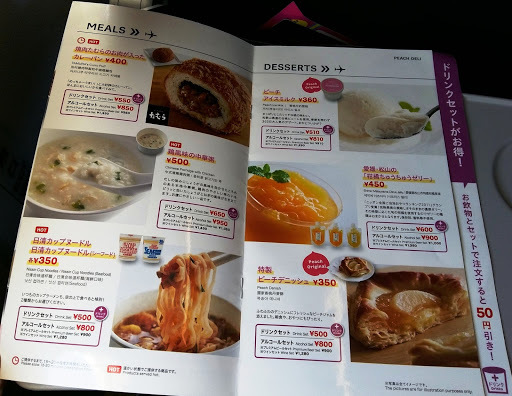 Peach air also offers a pretty sizable list of in-flight food and beverage, so since I had only really had a triangle kimbap I went ahead and ordered the first thing I saw with Japanese Curry on the menu. 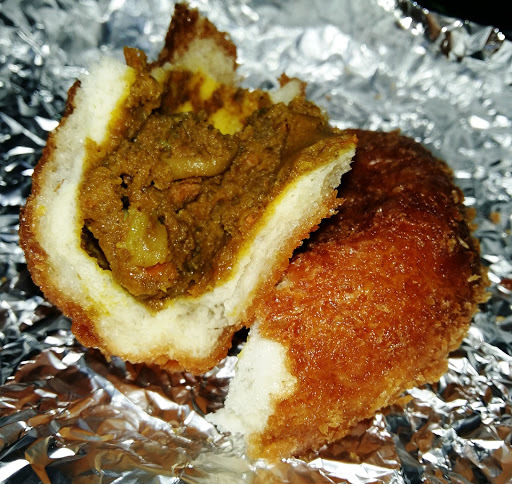 For just under 600 Yen ($6) I got a really delicious, slightly greasy “Tamura’s Curry Puff” – basically a savoury doughnut filled with delicious curry. Served up with a Monster Energy Drink I was ready for landing. 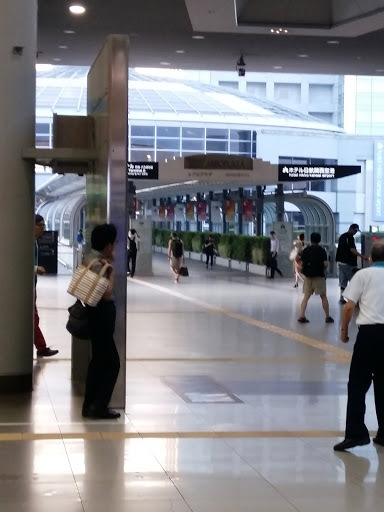 Navigating the Osaka Airport is really straightforward. 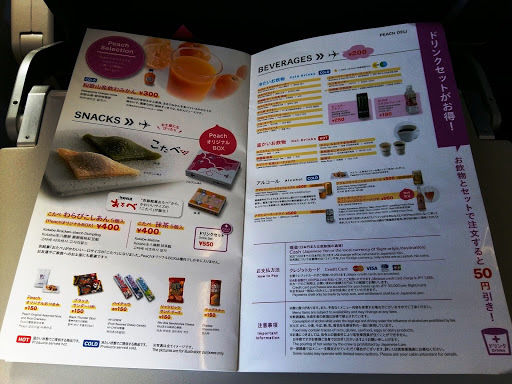 We took a shuttle to Terminal 1 (having flown into Terminal 2 which only deals with Peach flights) and before too long we bought our JR express rail tickets (about $11.50) which would take us directly to Fukushima station where our hostel was. There was some initial confusion about what time our train would depart. One man told our group a certain time, but I asked a conductor on a train rolling in if we should get on this train to Fukushima and he agreed so we ran onto the car pretty thrilled to have gotten seats. 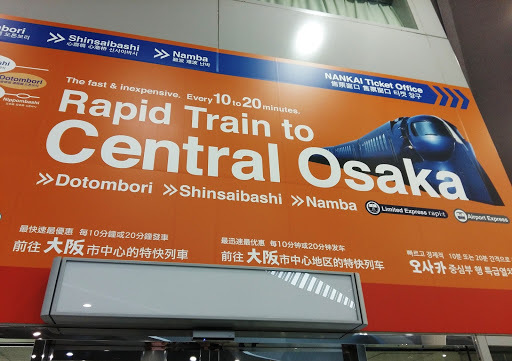 At first I was really concerned that our train was stopping at different stations – we had expected a direct train from Osaka Airport to Fukushima. I felt really bad that I had led our group astray, but as it turns out it’s just a really flippin’ long ride from the airport (70 minutes with no delays). Looking out over the houses and neighbourhoods of Osaka as the sun set was pretty cool. I didn’t really know what to expect so when I saw houses (as compared to the massive collections of apartments in Busan) I was pretty excited. The sunset was full of puffy, cotton candy-pink clouds as the sun went down and the beautiful blue sky darkened. We arrived tired and hungry, and were completely unsuspecting of the massive night out we were about to have.